This 2 bedroom apartment with swimming pool is located in Les Mathes and sleeps 6 people. It has WiFi and air conditioning. The apartment is near a beach. Mobile home, 4 - 6 people, 3 room/s, 2 bedroom/s, 2 bathroom/s, approximately 35 m², 1 floor/s, Access via external stairs without banister. Feature: Property on a campsite (177 units in total). Equipment: TV; internet access Wi-Fi (included); electric heating; air conditioning. Final cleaning by tenants or against payment, € 100. Holiday resort tax. Linen/towels available. Deposit € 400 (in cash, Visacard, Mastercard). Cot/​High chair free of charge (on order). Pet 2 animals allowed, € 35 per pet and week (please advise prior to arrival). Estate (shared use with holiday guests): approximately 4.5 ha, closed plot (fence, hedge, electric entrance gate with code), trees. 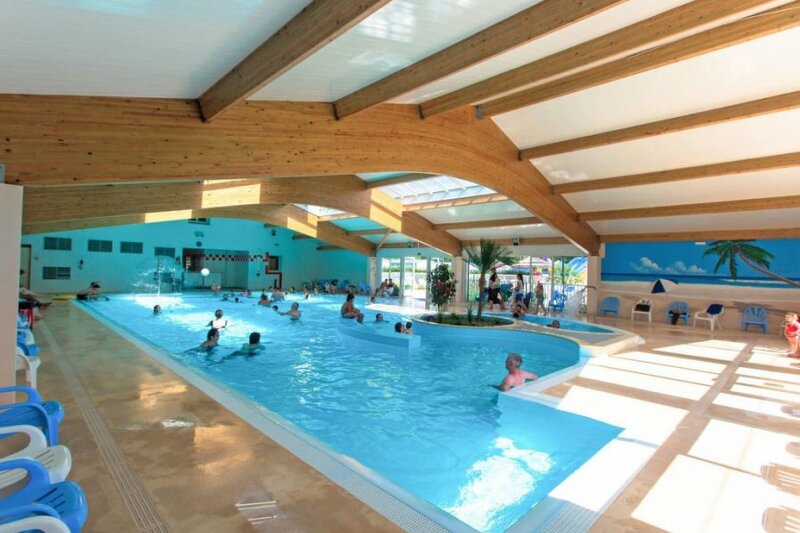 Indoor swimming pool (shared use): 260 m², 06/04/19-28/09/19, secured by a fence, heated, children's pool, slide, water current. Sports facilities/ leisure time: shared use (free of charge): beach volleyball, bowling/boccia, table tennis table, children's playground. Day care: included: animation for children, children's club, teen's club. Terrace (roofed, wood terrace, elevated), furnishing provided, 2 deck chairs, flattop barbecue. The agent describes this apartment as an ideal holiday rental for the summer holidays. It is also good value for money. The apartment has a swimming pool and is located in Les Mathes. The nearest airport is 141km away. It is set in a very convenient location, just 0 metres away from a beach and only 2.5km away from the city center.